Iain Duncan Smith is a British Conservative politician, who served as Secretary of State of Work and Pensions until he resigned in 2016. From 2001 to 2003 he served as leader of the Conservative party and Opposition. He currently serves as the MP for Chingford, and Woodford Green, formerly Chingford constituency, which he has represented since the 1992 general election. 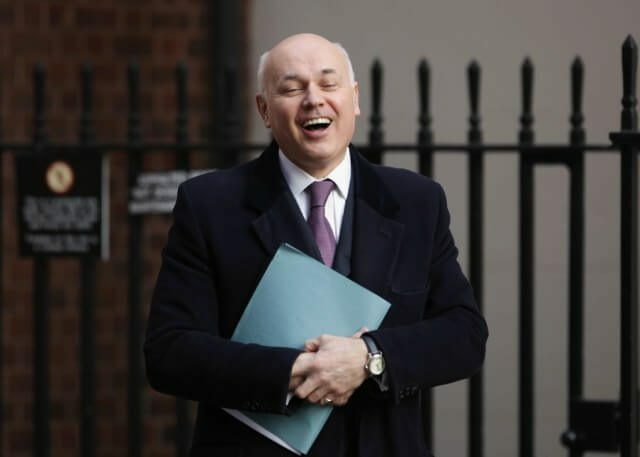 Born in Edinburgh, Duncan Smith served in the Scots Guards from 1975 to 1981, during which time he toured in Rhodesia and Northern Ireland, after being educated at the Royal Military Academy at Sandhurst. After joining the Conservatives in 1981, in 2001 he took over as the party’s leader from William Hague, winning popularity from the membership due to his support from Margaret Thatcher. Due to an increasing lack of faith in him as leader, Conservative MPs eventually passed a vote of no confidence in his leadership in 2003, after which he resigned and was replaced by Michael Howard. While on the parliamentary backbenches, he founded the centre-right Centre for Social Justice think tank, and in 2010 was appointed Secretary of State for Work and Pensions, until he resigned from the position in 2016 in protest at George Osborne’s intended welfare cuts revealed in the budget. In 2016, ahead of Britain’s EU Referendum, he campaigned for a Leave vote, commenting that the UK’s membership of the European Union ‘exposes [the] UK to terror risk’.